The August Bug-Off was on the 15th, and I was ready for it. 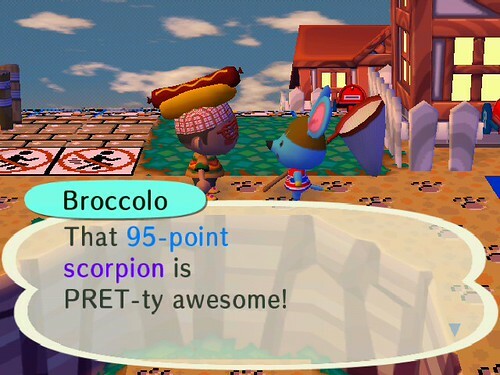 Since cutting down all the trees and removing the flowers, scorpions have been popping up everywhere. I usually see at least 2 per night. This left me with a ton of scorpions that are now taking up space in my house. I figured I had enough to spare so I decided to donate one to Nat and see what kind of score it would get. While it was still a good score, it didn’t come close to beating my July score of 115. As I wrote before, Shaolin’s had plenty of creepy crawlies since I completed the extreme makeover. The townies complained a little, but it’s worth it. I’ve been seeing so many scorpions and tarantulas, I would definitely suggest this method for anyone desperate to catch one this season. Unfortunately, now I’m in the middle of the slow rebuilding process. But I’m not going to cover Shaolin in flowers again. It’s too annoying to maintain. Anyway, the creepy crawlies have been out and about and I’ve been improving my methods for catching scorpions. They don’t even phase me anymore. I now have 6 in my house, it’s a little ridiculous how many I’ve seen. Tarantulas have been much more rare, but I still see them occasionally. At first I thought they only come out if none of the neighbors are around. But I saw Victoria walking right into a tarantula trap! Usually I make sure the pointer is not in the frame when I take a picture, but I was in a panicked rush to save Shaolin’s racehorse! I distracted her in time, and then set myself up to claim my prize of a pet tarantula. I waited until the pest was walking towards the wall, and not looking at me. When I pulled out my net, I heard the little ‘whoosh’ sound that the tarantula makes when it runs to attack. Instead of focusing on the ugly spider, I swung my net. Then I realized that for some reason, the tarantula had run straight into the wall, and now was turning around. I was still mid-swipe when the tarantula ran to my ankles and took a big bite. So I still don’t have a pet tarantula in my house. 😦 But I’ve got plenty of scorpions! Sunday nights are all about fireworks! 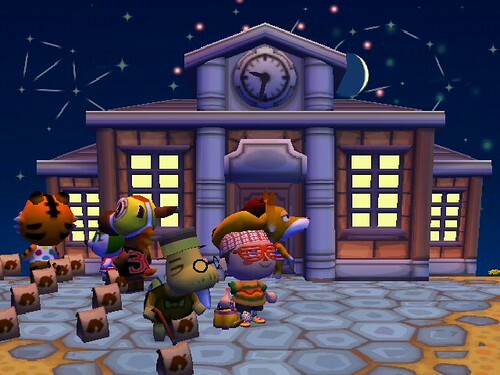 It’s always a blast, Tortimer hangs out at the Town Hall handing out dangerous small explosives. Townies who don’t mind the noise wander around the town, gazing up and clapping as the fireworks burst non-stop from 7pm-12am. It’s really great. I wish it was all summer instead of just August, but hey. It’s fun and I like it. I was able to take a great picture of half the town enjoying the festivities last week. Shaolin’s Gates will be open after 7pm EST for the final fireworks celebration of the summer. Stop by for your last chance to see the fireworks from atop the Shaolin Lighthouse! Please comment or email me if you want to come by, so I know when to make sure the gate is open. I might be playing on and off, but I’d love to have visitors for the last hurrah of the season. And it would be a great chance for you to help rebuild Shaolin’s foliage, since our August Town Charm is to plant one flower. 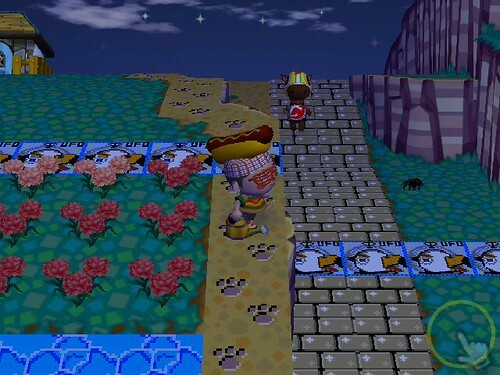 So bring over any flower you want and enjoy the show from the highest vantage point in Animal Crossing – the Lighthouse! She left very silently, there was no warning. I didn’t see her pack. 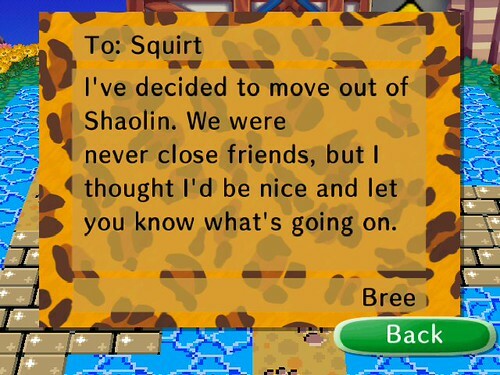 But today her house was gone, and all of Shaolin rejoiced! The dark cloud of Bree is finally gone! We are now a one-mouse town. For now. I really hope I get a super cool new neighbor! And I also hope they choose a new area to place their house, because I’m really sick of all the animals living on the east side of town. We need to even things out! Apollo and Elise are all alone out there on the west side! 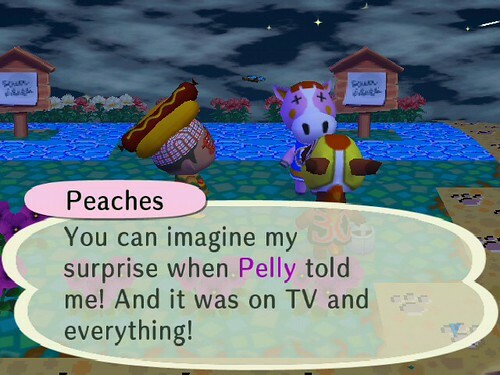 Giant Petaltail, Jellyfish, and DLC… Oh My!